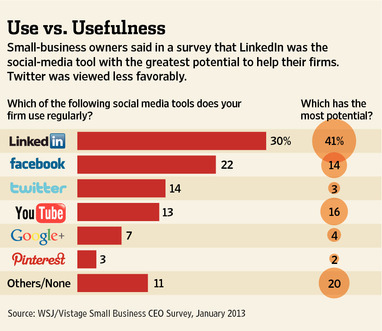 The Wall Street Journal recently did a poll and surprise, surprise LinkedIn tops the list as the most useful small business social media resource. Not surprisingly, Twitter was at the bottom of the list. So, the message here is LinkedIn is where you NEED to be to get more business. Twitter is, well for Twittering away your time, of course!